The biggest extinction event since the oxygen revolution occurred in the end of the Permian, about 252 million years ago. During the event 70 % of land life, and even 95% of the sea species went extinct. The destruction apparently occurred in several subsequent steps. Many of their details are still controversial, but the general scheme is gradually being understood. During the Carbonaceous era, the carbon dioxide content of the atmosphere had fallen down to about the same level where it is now, to about 400 ppm, in the process that formed most of the fossil coal reserves on the Earth. 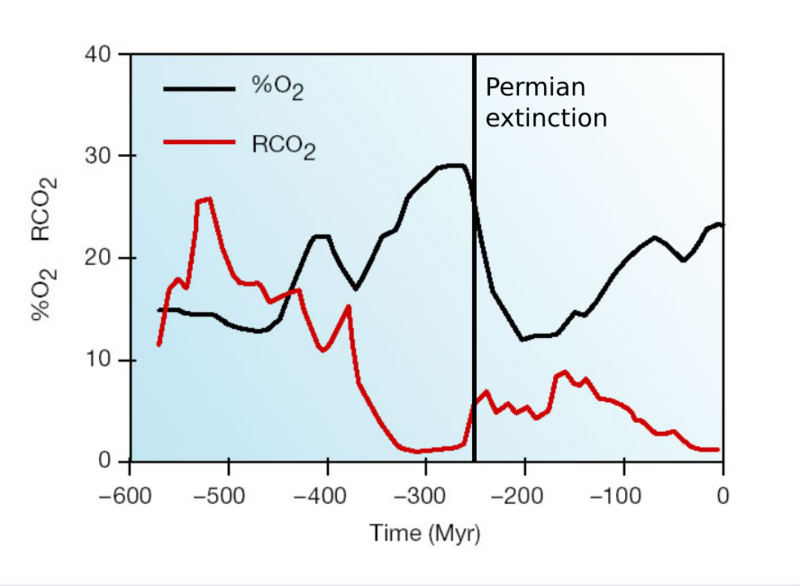 As a consequence, the climate was cold in the early Permian. Also the oxygen content of the atmosphere had risen very high, to over 30% of the atmosphere, allowing the appearance of gigantic insects, like large dragon flies. Towards the end of the Permian, massive volcanism in the Siberian traps, and massive forest fires released large amounts of carbon dioxide into the atmosphere. Its level rose even to the level of 2000 ppm, causing a strong climate warming. The methane hydrates in the ocean bottoms were released, and the climate warmed up even more. The warm climate increased the solubility of the nutrients in the soils; These were washed into the oceans where, together with the warm climate, they caused strong outgrowth of the oceans’ vegetation. Increasing biomass used up the oxygen from the deep oceans, which became colonized by anaerobic bacteria, producing large amounts of toxic hydrogen sulphide. The anoxic, hydrogen sulphide-rich conditions were spreading also to the shallow seas, and large amounts of sea animals died out; consequently, toxic hydrogen sulphide was also being released to the atmosphere. Again, the forest fires and the methane and hydrogen sulphide oxidation used up much of the oxygen in the atmosphere, reducing its content from the 30%, down to the level of 13%, which corresponds to the current oxygen concentration at the height of 5 km in the atmosphere. In addition, the ashes that were released in the atmosphere caused some cold spells, similar to the nuclear winter conditions. 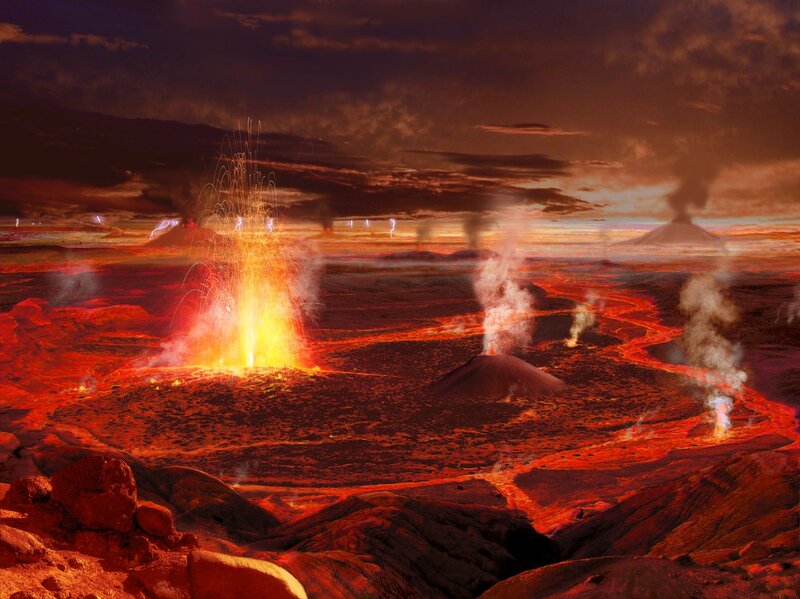 The decreasing oxygen level and the quickly alternating climate led to massive extinctions also on the land. It is possible that also a meteorite impact still added to the destruction. The recovery from this massive extinction happened very slowly, but the big destruction event also created space for the reign of reptiles at the Mesozoic era. However, the carbon dioxide level remained high, and the climate in the Mesozoic era was very warm. 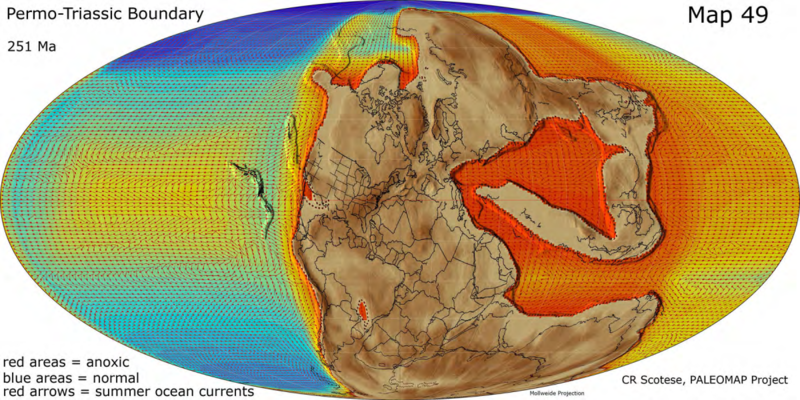 Oceans were suffering severe lack of oxygen during the Permian extiction. Image: Christopher R. Scotese.